We’re led to the shop by the owner of the hotel we’re staying at. He’s offered us a ride to the ruins outside of town and we can just wait here until the shuttle arrives. Uh-oh, we think. Inside, Yilmaz (Marco to his friends…of which I now count myself as one) welcomes us warmly, offers us a seat and quickly motions to his nephew to get us some apple tea. We chit-chat about how long we’ve been in Turkey, where have we visited and what else we must see before we leave. 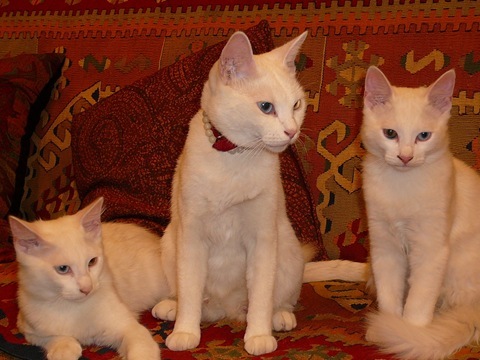 He tells us he is Kurdish, from the Lake Van region in Eastern Turkey (where we, sadly, did not get to) and introduces us to his three ‘Van’ cats, characterized by their white, white fur and different colored eyes (one is blue and the other yellow). They are striking and we get carried away playing with them. Not long after we arrive, a Norwegian woman enters having also been offered a ride out of town. Tea is brought for her also and we settle into an easy conversation. She is well traveled, as is Marco (he travels to North America in the winter season to sell his carpets) and we talk mainly about travel and how easy it has been in Turkey. The shuttle soon arrives and Marco bids us farewell giving each of us a nice guidebook to the ruins asking only that we return the book in the afternoon. Uh-oh, we think. We enjoyed a nice day at the ruins, walked back to town and headed to Marco’s shop to return the guidebook. Although he was seemingly busy with a customer (carpets strewn everywhere), he greeted us as old friends and again we sat and drank tea while we listened to him discussing carpets and materials and weaving techniques with Michael from America. 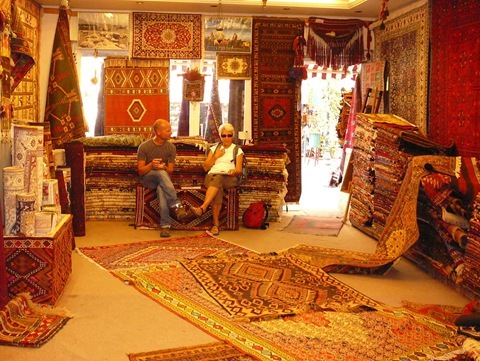 Turns out Michael wasn’t in the market for a carpet…he had already purchased his limit at another store in Istanbul. Marco knew this the whole time…their conversation was not about Michael buying a carpet but a conversation about carpets in general…Marco just likes to talk, and a conversation about carpets is just up his alley. Soon, Michaels wife came and whisked him away but, before he left he stood up and said “Well, I am certain that I bought my carpets from the wrong place. I should have got them from here”. Uh-oh, we think. Once Michael leaves Marco, Jason and I start talking about carpets and kilims and the differences between them (carpets have pile, kilims do not), and about the stock that Marco keeps (primarily nomadic designs from eastern Turkey). He tells us the carpet shop is a family business, run alongside the fabric shop across the road and the knick knack shop up the road (and, it turns out, the hotel we’re staying at). We learn that he he left eastern Turkey for Istanbul but moved to Selcuk a while ago and prefers its small town community feel (Selcuk really is a nice town…the friendliest we have visited here in Turkey). We ask if he could show us some kilims. Uh-oh, you’re thinking. He asks if we’re interested in buying and what our budget might be. We tell him we might be interested but that we are woeful backpackers with a teeny tiny budget and an inability to take anything with us. He understands and explains that it is his job to help people a piece of Turkey to take home. We tell him our teeny tiny number…he manages to keep a straight face and does not snort at the teeny tinyess of it. He calls out to his partner and, together, they pull out kilim after kilim unfolding them and laying them out one after another. Do we like this one…no, the color is too purple. How about this one….no, the pattern is too ‘chunky’. Here’s another…yes, that one is nice. And over here…no, too big/too small/too long. I know you’ll like this one…yes, you’re right it’s very nice. Until the floor is covered…and they’re all beautiful. Just then I heard a voice outside that I recognized. Briar, Debbie, Angela and Ella…who were all on the gulet cruise with us…were returning to the shop so that Angela could have one more look at the four kilims she was choosing among for herself. They had originally come to the shop on the recommendation from some friends from home who had purchased carpets from Marco the previous year on their trip to Turkey. It was the first time we have run into travelers that we’d met previously and we spent some time catching up and oohing and ahhing over Angela’s selections. In no time there was tea in my hands again and the conversation had turned from carpets and kilims to travel and adventures to life in Turkey and Canada and all things in between. Two hours had easily passed as we all sat, like old friends, drinking tea, chatting and playing with the cats. 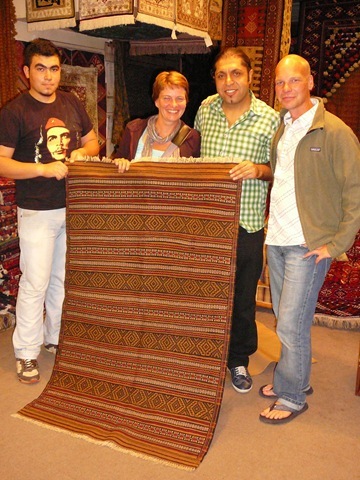 Once the girls left we got back to business and, now that Marco knew our style, he easily found 3 or 4 kilims that fit. How much, we asked. Triple our teeny tiny budget. Uh-oh, we think. I explained that, although they were beautiful, there was no possible way we could stretch our teeny tiny budget to that level. Could he please show us some pieces that are closer to our teeny tiny budget? He does, and we find one that matches both our style and our budget. It is not as beautiful as the bigger, more expensive one but it is nice. I ask again about the price for the larger one. Are you sure that is your lowest price? Could the price not possibly be closer to our teeny tiny budget? He moves a teeny tiny bit closer but explains that he paid more than that for the piece and could not possibly go any lower. I understand and ask that he save the smaller kilim in back while we go for dinner and decide if it is the one for us. He asks if he should also save the larger one…no, I say. it is not a possibility and I do not want to get my hopes up. At dinner, Jason and I discussed the small kilim (which is well within our teeny tiny budget) and the larger one also. What would we pay at home for a nice piece like this? Wouldn’t it be something we would treasure forever? Could we afford it? In the end we decided to try for the larger kilim. We adjusted our budget and talked about bargaining strategy. In the end, if it didn’t work out, we would take the smaller carpet and be perfectly happy with it (and the story of how we got it). We return to the shop after dinner and are, once again, welcomed warmly. The small kilim is brought out and we talk about how it really is a nice piece. I ask if I could just see the other piece one more time. Marco finds it, lays it out and I remark again on how beautiful it is and how wonderful it would be to take it home. I make the first move and soon Marco and I are waltzing through the steps of the bargaining process. It’s a dance that he is well practiced at and I feel I am graduating from the sock hop to the prom in one fell swoop. He is kind and generous as he leads me around the dance floor, allowing me to step on his toes once or twice and encouraging me when I’ve done well. When the music stopped and we had sashayed our way to the finish, we shook hands as we agreed on a price. Did we, in the end, get a screaming deal on a kilim? No, but we did get a great piece of craftsmanship and a great experience at a great shop, for a good price. Marco and his shop (Eastern Anatolia Nomadic Art Gallery) can be found in Selcuk, near Ephesis, on the western coast of Turkey. I strongly recommend paying him a visit…tell him I said hello.